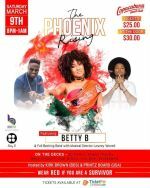 The Copacabana presents The Phoenix Rising. Featuring Betty B & full backing band with musical director Lowrey Worrell. Wear Red if you are a survivor!